The pond is now 10! Work to create the pond started in September 1997, so it is now 10 years old. Over the next few months a number of pictures showing the pond's construction and initial development will be displayed here. To see more of the pictures taken during the construction of the pond, click here. Here you can see a part of the grey hessian sheeting used to cover the butyl liner for extra protection. On top of this, a layer of sieved soil and then a layer of sand was put down for plants to set root in. The layer of sand was used to stop the soil being washed away when it was originally filled with water. Ponds are becoming more important because their numbers are in decline. As ponds are lost, the pond animals and plants will either become locally extinct or be forced to colonize other water bodies nearby. 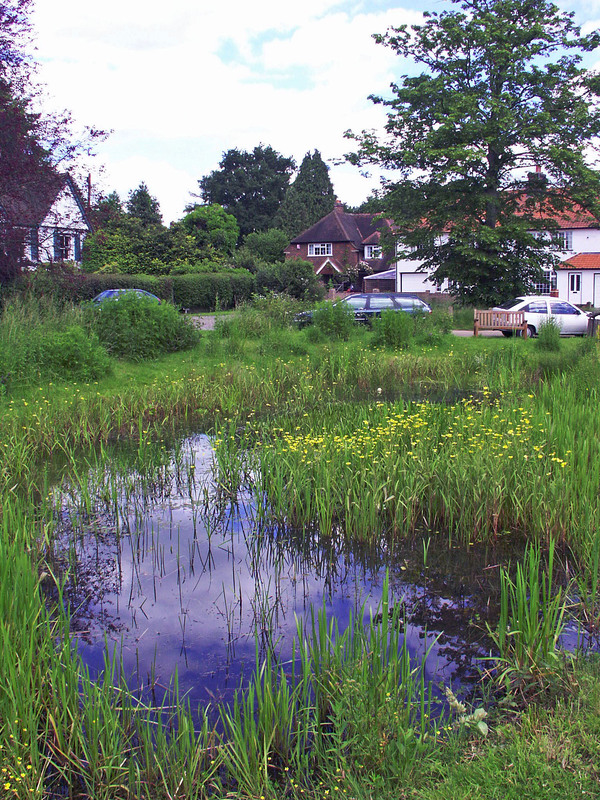 Those ponds that remain, including garden and village ponds, provide an important wildlife refuge for freshwater creatures. 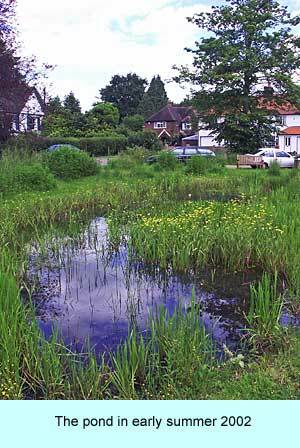 However, even those ponds remaining are often under threat from drainage, pollution, or neglect. Although many ponds have been lost, the good news is that new ponds are being created every year, which helps to compensate for the loss of old ponds. However, new ponds are a different type of habitat to old ponds, and many animals and plants are adapted to the specific conditions provided by old ponds. It is therefore important to protect them and stop them from becoming lost or damaged. Although there is no such thing as the ideal pond, there are several features that should be included or encouraged to maximize a pond to its full wildlife potential. Different depths of water. Some parts of the pond should hold water all year round whilst other parts should be allowed to have a draw-down zone that dries out as the summer progresses. A diverse range of native plants that should include marginals (e.g. water mint), emergents (e.g. greater spearwort), submergent (e.g. rigid hornwort) and floating (e.g. water-lilies). Varying the slope of the banks with some gently shelving margins will allow better development of plants that prefer to grow in the shallows around the ponds edge. This will also allow amphibians easier access to and from the pond. What is growing around the pond is as important to the creatures that live there as the water itself. Habitats including, meadows, scrub woodland all provide shelter, food and breeding sites for a wide range of pond creatures, particularly amphibians and dragonflies. Drying out is damaging - Actually, many species need this to happen to complete their breeding cycle. Ponds should be deep - Shallow water supports the most number of pond species because it is richer in both oxygen and light. Ponds require frequent dredging - Some occasional clearance is needed to prevent the loss of the pond, but too much will result in a loss of the wildlife. Visual appearance is a measure of value – Don’t judge ponds by their appearance. Some of the least visually attractive ponds to human eyes are amongst the most important for wildlife. Ponds should contain fish - Fish can be part of a naturally developed food chain within a pond, but introduced types (particularly those of the carp family) commonly cause much damage to ponds’ delicately balanced ecosystems because they tend to eat anything and everything around, leading to an overall reduction in wildlife. Ponds should have ducks - Problems occur when ducks receive extra food from Man, normally in the form of bread. This usually encourages them to stay and increase in number. This in turn leads to an increase in faecal matter being deposited in the water, and overgrazing of plants and other wildlife. Large quantities of faecal matter can reduce the quality of water through nutrient enrichment. 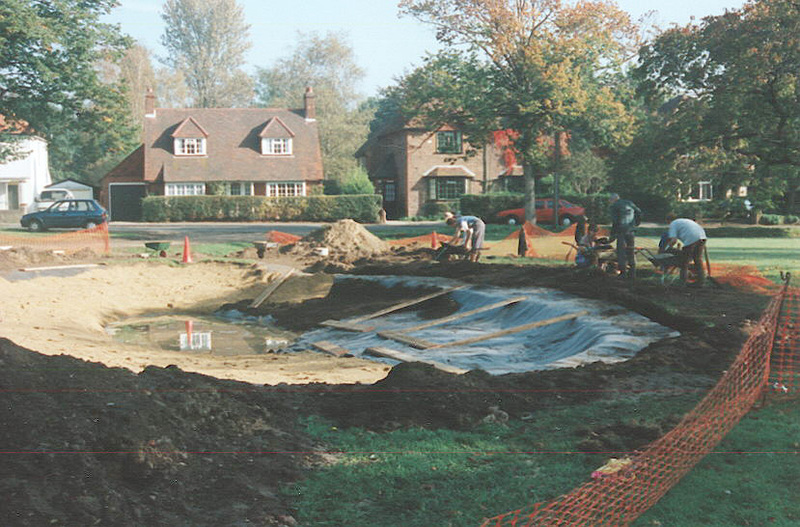 In 1995 a survey of the borough’s ponds was started by the Surrey Wildlife Trust. 135 ponds (excluding school and garden ponds) were identified from local knowledge and map evidence. Detailed ecological and environmental surveys were carried out on 50 of these ponds during 1995. Another 50 were surveyed the following year. Part of the survey included a search to reveal the loss of ponds in the borough since 1870 when an estimated 211 ponds existed. Today, approximately 135 ponds exist (excluding school and garden ponds), of which, 64 are original old ponds, and 71 that have been created since 1870. With thanks to Surrey Wildlife Trust and Woking Borough Council.